Learn how to draw anything by seeking out shapes - basic drawing skills to help beginners get started drawing quickly and easily. I want to get you started drawing by sketching nature. The objective of the drawing lesson on this page is to understand how to sketch out the basic shapes of your drawing so that your drawing is recognisable and accurate. This is important because although art doesn’t have to look ‘realistic’ you do want your drawing to look recognisable (unless you choose to play with the shapes and proportions for style and effect) - and not to give your viewer the sensation that “there’s just something wrong about it” which can often be the case when we get things even subtly wrong. Accuracy is something even experienced artists still need to work hard to achieve, so do accept that this will need practice and however hard you practice you will still get it wrong sometimes – but I’m going to show you the little drawing tricks and techniques that make it easier. The drawing techniques I’m going to share with you will build your skills to help you to feel confident to draw whatever you want. I’m not actually teaching you how to draw leaves (although that’s what we’re going to practice on) – I’m giving you the skills to learn how to draw anything…. but we’re starting very simply with a basic leaf. You will be able to apply these basic steps to anything you want to draw with a little practice! 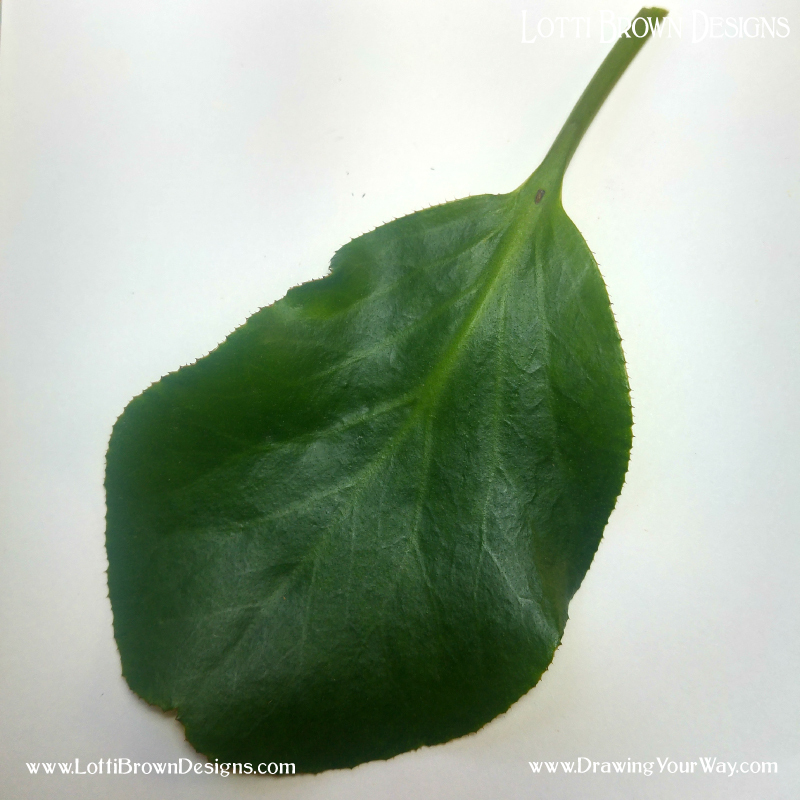 Ideally, in these lessons, you would draw from leaves and flowers you’ve collected yourself, as I believe that that’s more motivating and interesting for you – but I have also provided some reference photos that you can use too, so that you can get started from these photos if you don’t yet have your own ready. Starting out, it’s much more fun and you can start to look, learn, and understand about what you’re drawing far more easily when you have your subject right in front of you and can easily take a closer look and understand how it ‘works’. Nature art is a wonderful place to start with your drawing, as in addition to that wonderful and calming sense of connection to nature, organic shapes are easy to draw and very forgiving of any little lapses of proportion or perspective so that you can get a good-looking and characterful artwork without too much practice. No wonder nature is such a popular subject matter for artists! In these first drawing lessons, we’re going to look at how to start to portray the shape and form of what you’re drawing. We’re going to start by roughly sketching out the basic shapes, positions and angles of what we’re drawing. Think of this as a ‘guide’ or a preparatory sketch before we do the ‘proper’ drawing. We’re going to use one of our very light/fine pencils for this (a ‘hard’ pencil) – HB, H, 2H, 3H, or 4H. Hold the pencil loosely, about half-way down the pencil length, and press only very lightly on your paper. These lines aren’t going to be a part of our final drawing, so there’s no pressure for them to be in the right place first time. Remember to press very lightly so that we can rub them out easily at the end. Let’s start with a basic leaf shape. Choose a simple one this time. We’ll look at something more complex later. Remember, we’re learning drawing techniques for how to draw anything in this lesson, not learning how to draw a leaf. Put your leaf in front of you on a plain, light-coloured surface, such as a piece of paper. Now look at it. Remember, most of art is the LOOKING stage – looking at your leaf, noticing things about it and understanding it. So pick it up and hold it, inspect it closely and familiarise yourself with it. The main thing that we’re going to look at and understand first is the shape of the leaf. 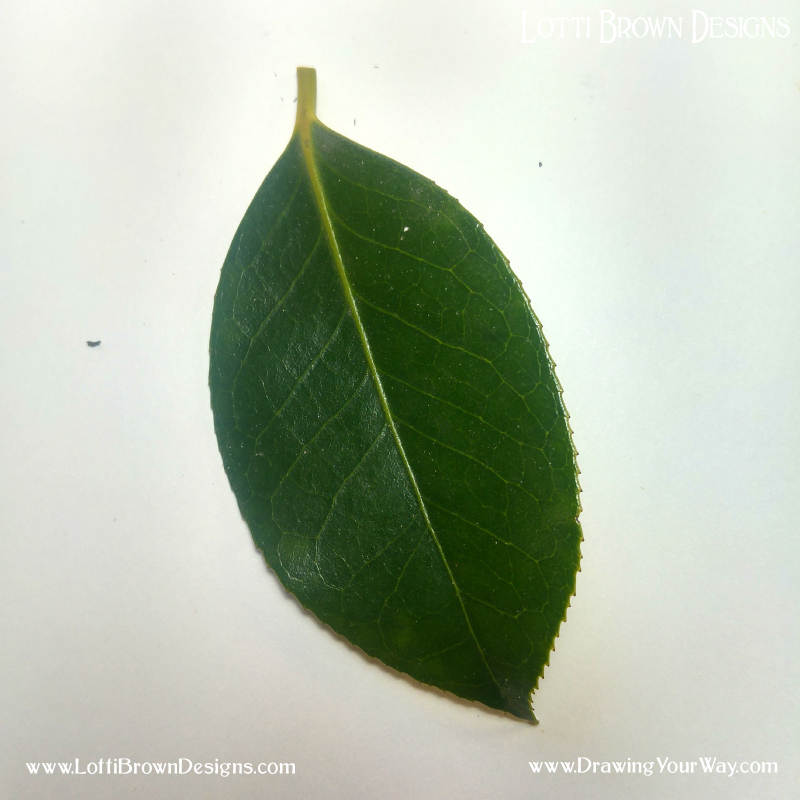 Putting your leaf back on the surface, half-close your eyes and un-focus for a moment when you look at it (get used to doing this – it’s so useful for taking an overall look at your art or your subject matter without getting bogged down in all the details). What’s your leaf’s basic shape? We’re going to draw this basic shape out, loosely, with our pencil, right on our page. Click the images below to see them full-sized. Now let’s look at the extra shapes that actually make your leaf a leaf and not a circle, square or oval. Let’s draw in the points and the stalk, just very lightly and roughly with our pencils. Each point or stalk goes about at the centre point, top and bottom, so just ‘guesstimate’ where this is. Try and see how long or how large these look against the shape and where they fall on the shape. If you like, you can put guide lines running through your basic shape to help you to work out where the mid-point of your circle/shape is, or if it needs to be in quarters, thirds, or where you think the proportion falls. Click the images below to see them full-sized. Are you happy with it? Does it look like your leaf? If not, rub it out and try again, or start on another sheet of paper. Now, your pencil drawing should look rough and quite scribbly, but still very light. This is perfect. Now, we’re going to swap pencils or use our drawing pen so that we can put a firmer line in, because now we know where we want that to be and we’ve also got a guide to help us with it. In this part of the drawing, we want a firmer, stronger, confident line. We’re going to use one of our thicker pencils for this (the ‘soft’ pencils: HB, B, 2B, 3B, 4B) or our black fineliner pen. This is also the part of the drawing where we don’t need to worry about getting it right or accurate, as we’ve already done the prep-work for that with our guidelines – and we know that they’re in the right place. We just need to use these and take advantage of the hard work we’ve already done. And luckily, there’s no effort involved in getting that bit right. Relax, and that bit will happen naturally and your drawing will become more and more distinctive and beautiful with practice. 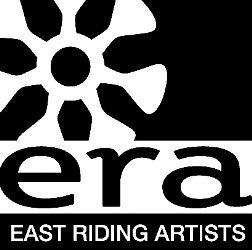 All we need is a firm, confident line – so make sure that your music is playing something you love and you’re nicely topped up with tea, coffee, whatever… and take your pen or pencil in your hand. This time, you can hold your pen or pencil more firmly and closer to the tip. You don’t need to press very hard but a strong contact with the paper will give a lovely, confident line. Look between your pencil or pen tip and your page – but do try to look a little more at the leaf so as not to get too absorbed in your page and forget to look at the leaf. 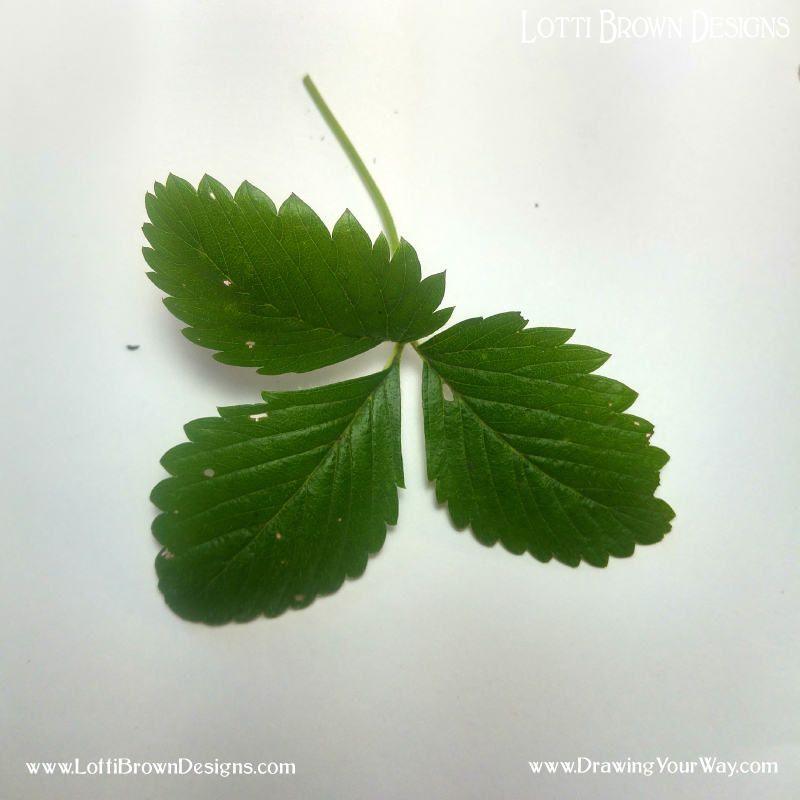 Draw that firm line of the shape of your leaf, following the guidelines that are already there. It doesn’t matter if you’re not on the guidelines exactly – this is expressive and not technical art! There! Your first basic leaf shape. How did yours go? What shape would you make these leaves? I sketch in the way the leaf would fit into a square box to get the basic outline. It doesn’t matter if you would’ve picked a different shape. What works for you is right! I add the outline in with my drawing pen and add detail to the leaves. I could now rub out my guidelines if I wished. Learning how to draw anything in simple steps - studying how to draw a leaf step by step can be applied to any subject matter you want… it might just be a bit more complex! I’d love you to practice with drawing a few more simple leaves. Experiment with making your hand move faster or slower as you draw. How does it feel? What does your leaf look like? What about if you change your music? Remember, this simple leaf is just the first very simple step in a more complex ballet. But understanding this idea is the one basic step that allows you to use this technique of looking for shapes and using them in your drawing so that you can start drawing absolutely anything in this same way. So soon, and with practice drawing more simple and then complex shapes, we’ll have you knowing just how to draw anything beautifully, confidently, and in your own unique style.